Lance Armstrong has scrapped plans to enter a swim race in Texas following objections from the sport’s global governing body, it was reported Thursday. Armstrong, 41, who was stripped of his seven Tour de France wins and banned for life before later confessing to drug-taking throughout his career, had hoped to compete in a U.S. Masters Swimming event in Austin this weekend. However Armstrong’s participation in the event was swiftly opposed by swimming’s governing body, FINA, which issued a statement saying the cyclist should be barred from competing under anti-doping regulations. Who says you can’t teach an old dog new tricks – a trainer in New Zealand is teaching man’s best friend to drive – really! The SPCA in Auckland thought it would be a good way to showcase how smart rescue dogs are and perhaps improve their adoption rate. So they called on animal trainer, Mark Vette, who was up for the challenge. *As in Practical Urban Mushing. 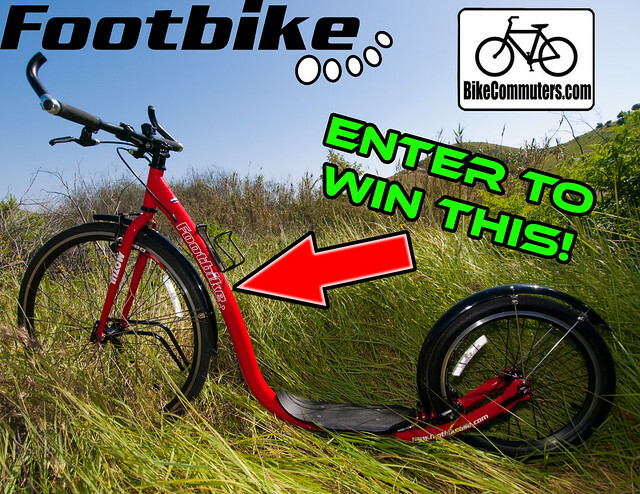 FootbikeUSA has graciously offered one of their famous machines to be given away in a contest exclusive to BikeCommuters.com! You can enter to win this beautiful, fun and practical machine just by providing us the correct answer to our trivia question. We’ll be picking a random winner with the correct answer on 12/17/2012. Join the action at BikeCommuters.com (though it might also be good for an actual bicycle rider to find out what s/he’s missing).